Making it into our top 10, Newcastle is one of the UK’s major tech hubs and boasts an £11.2m science quarter. Could the city nurture your business? Why start a business in Newcastle? The financial and cultural centre of the North East, Newcastle has acquired a reputation for being one of the UK’s centres of high-tech industry, with renewable energy and manufacturing businesses particularly prevalent. The Newcastle Science City project touts this reputation and claims the city is the key city in the UK for science businesses. This reputation was further enhanced with the opening of the EU and council-backed Core, Science Central back in November 2014 – the £11.2m centre acts as a 5,000 sq m growth accelerator for spin-out companies from Newcastle University and firms focused on science, technology and sustainability more generally. As well as being exceptionally well-connected to its regional neighbours (the Metro public transport system connects Newcastle, Gateshead, Sunderland and other stops along the coast), it takes just two hours 50 minutes to get to London Kings Cross on the fastest train, despite its relatively far-flung location. Newcastle International Airport is also close by; serving a number of destinations in Europe and worldwide, it is also accessible via the Metro public transport system. Newcastle boasts a number of appealing locations for start-ups, particularly tech and energy businesses. The North East Enterprise Zone covers 10 sites within the three key areas of the Low Carbon Vehicle Corridor, the North Bank of River Tyne and Port of Blyth; businesses located in these areas gain access to a number of incentives including reduced business rates, enhanced capital allowances and a quicker planning process for new builds. The North Bank of the River Tyne is also one of five Centres for Offshore Renewable Engineering (CORE) in the UK and benefits from its close proximity to the National Renewable Energy Centre in Blyth. 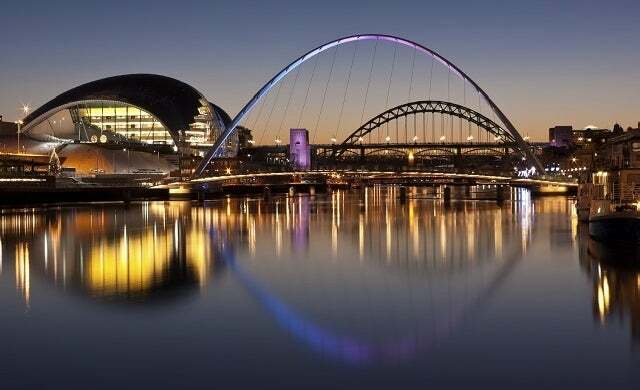 Known as the region’s major student centre, the city has two universities within its borders – Newcastle University and Northumbria University – with Durham University also a short distance away. Businesses based in the area can benefit from a range of services for business offered by Newcastle University, including collaboration on R&D projects, development and training, access to laboratory facilities and more. Over a third (36.9%) of Newcastle’s working age population have NVQ Level 4 qualifications and above as of 2015 – around average for a city of its size – with average weekly earnings standing at £507.90 median as of 2016. Newcastle has one major accelerator – Ignite100. Ignite100 is a mentorship-driven accelerator programme for tech and digital start-ups that invests £18,000 in businesses across an 18-week programme running three times a year. Established in 2011, Ignite100 also runs Campus North, a 10,000 sq ft venue dedicated to tech start-ups which will host more than 150 founders, developers and designers and operate an ongoing incubator programme for tenant businesses. It offers space on a co-working model. Another recently opened co-working space is the Toffee Factory, targeted at digital and creative companies. Businesses also can access free workshops and business support through the EU-backed Business & IP Centre Newcastle, a venture launched in conjunction with the British Library. Various options exist for office space around the capital, with supply of Grade A premises estimated at around 190,000 sq ft in total. Major developments include Baltic Place, Wellbar Central in Gallowgate, and the recently refurbished The Pearl, which account for the greatest portion of availability. As mentioned above, the recent opening of Newcastle Science Central is providing a major boost to support and office space availability for tech businesses in the region, so now is the time to look at snapping up some of the space available as much of it has already been let. In October 2016, Newcastle City Council announced a partnership with peer to peer lender Funding Circle to provide a new funding option for businesses in the city; an addition which cemented Newcastle in our top 10. The city council is one of the first to partner on a deal of this kind and is committed to lending directly to businesses with loans available from £5,000 to £1m and loan terms from six months to five years. Newcastle City Council has also suggested that it may participate in loans. There are three major angel networks in the city, with the most prominent being the Viking Fund Managers-administered North East Business Angels, which invests in 30 to 40 businesses a year. Other networks Angels Den which has regional managers, and Gabriel Investors, a private network offering up to £150,000 investment in female-led businesses. With 1,260 new start-ups in the region as of 2015, Newcastle’s start-up population has increased significantly over the years and it has a better survival rate than bigger cities such as Birmingham and Manchester. The proportion of 2010 start-ups that survived to 2015 was 38.6%. Crime rates have risen from 74.40 crimes committed per 1,000 people in March 2014 to 80.2 as of June 2015. This is significantly lower than the larger urban centres of Manchester and Liverpool and below the national average of 84.23. Newcastle has a long-standing pedigree as a major destination for entertainment and culture, and its nightlife is somewhat legendary amongst the region’s residents. It is also a very picturesque city, with the highest ratio of Grade I and II-listed buildings as a proportion of all listed buildings in the UK. Annual events include Newcastle Fashion Week and Newcastle Restaurant Week – a bi-annual event which allows residents to dine out at high-end restaurants for just £10 or £15 per head. A first-hand account from an early-stage start-up on what it’s like to start a business in Newcastle and what the city has to offer new entrepreneurs. Gain insight into the city’s networking events, how and where to access finance, business support, and the best venues for client meetings and company nights out. You can also gauge insider opinion on what more Newcastle needs to do to accommodate start-ups. Pitched as “SoundCloud for video”, the growing business talks to Startups about running a company in Newcastle. Read its start-up story here.